I wouldn’t use this on my kids or near my kids but my husband uses it for himself after a late night shower and he likes it. To be honest I am not really sure what baby powder is for. To keep them dry I think, but when you think about it sticking this perfumed artificial stuff on their butts is weird. So I never did. Smells nice though. The only baby powder to use! The only baby powder I use. I recommend this for all my mum friends, stops chaffing instantly and lasts hours. I reapply with every nappy change and cannot fault this. I never get build up and removes easily. use it all the time.. I have a 3 month old and the times I used it, it didn’t seem to do its job. I’m now using more natural products for my baby and never had to use it again. 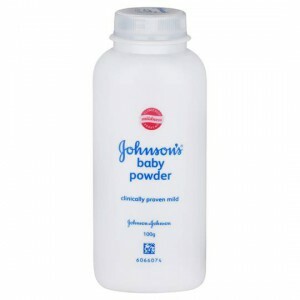 I used Johnsons Baby Powder 15 years ago when I had my 1st baby. I then did research into the chemicals that Johnsons put in it. I threw out my container of baby powder and purchased their cornstarch powder. So much better for my baby! My toddler gave it a new name. Johnson’s Baby Powder is the mildest and seems to have been around forever – back when I was in metal tins. Yes, I found one which was almost empty in the back of the linen cupboard that would have been about 50 years old. It still had what I think was its original aroma and snowy white in colour. I have used Johnsons baby powder on myself and my kids fir years. I even used it as a kid myself. It’s so soft and the smell is delicious. I have used Johnson’s baby powder for as long as I can remember with no adverse effects. I love the smell of the fragrance and it feels so good on skin. I used this product on my toddler ever since he was a newborn. It was a famous and affordable household brand we all knew and was dated back for many decades. After recent headlines about the carcinogen chemicals found in this product, I no longer feel confident to use this in our family. How would you rate Johnson’s Baby Powder?